The Uprite Ergo Sit2stand Workstation converts your desk to a sit-to-stand workstation quickly for better work on your preferred levels. Making the switch to an adjustable height desk doesn't have to be daunting - there are workstations that can assist you without leaving your current desk. Take your work to the next level with the Uprite Ergo Sit2stand Workstation - simply set on your existing desktop and easily adjust to your height with the touch of a lever. The internal cable management system organizes your cords and shelters them out of the way, giving your desk a supremely clean look the office will love. It's one desk upgrade that's sure to make a huge difference from the get-go. The Ergo Sit2stand Workstation by Uprite is a great way to take that stationary desk and convert it to the height-adjustable workstation of dreams to get you working better. The Uprite Ergo has 18" of vertical height adjustability, allowing you to position it at a comfortable level for you work style. It also features a minimal footprint, and easily slides out of the way to when you don't need it. Get that stand-up desk and work experience with one major desktop addition. 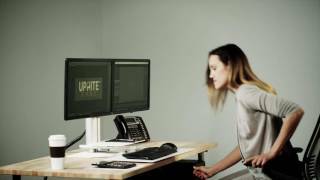 The Uprite Ergo Sit2stand Workstation can be configured for one or two monitors. The single monitor configuration is available with two different weight capacities. The color options for the Uprite Ergo Sit2stand Workstation are black with black accents or silver with white accents. Add an UPLIFT Standing Desk Mat to your sit-stand desk. Our 18" x 30" anti-fatigue mat has a gel foam core, providing comfort and support while you are standing, and it's lightweight and easy to move aside when it's time to sit down. $400.00 List Price: $700.00* The list price is the same as the MSRP (Manufacturer's Suggested Retail Price). It may not necessarily be the price at which the product is sold.